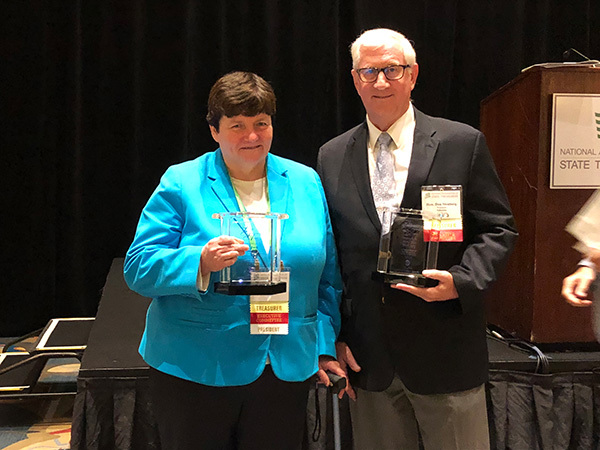 Treasurer Don Stenberg of Nebraska and Treasurer Beth Pearce of Vermont receive Lifetime Achievement Awards from the National Association of Unclaimed Property Administrators. Nebraska State Treasurer Don Stenberg has received the Lifetime Achievement Award, the highest honor presented by the National Association of Unclaimed Property Administrators (NAUPA). The award was presented at a recent training symposium of the National Association of State Treasurers (NAST). Also honored with a Lifetime Achievement Award was Beth Pearce, State Treasurer of Vermont. Pearce is the current president of NAST. Both Stenberg and Pearce are past presidents of NAUPA, an association of state officials charged with collecting and returning unclaimed property to owners. NAUPA is a network of NAST. Johnston said both also were instrumental in securing resources for NAUPA’s recent strategic planning process. “This was a team effort,” Stenberg said about his work with Pearce to provide research and recommendations to the Uniform Law Commission to update and improve the Model Uniform Unclaimed Property Act. The original act was written in 1954 and last revised in 1995. “When we needed diplomacy, Beth Pearce handled that, and when we needed something else, I pretty much did that. We were really quite successful and moved the needle a lot in favor of consumer protection. I very much appreciate this award and the opportunity to work with many of you over the years,” Stenberg said. This was the third national award Stenberg has received during his two terms as Nebraska Treasurer. In 2017, he received the Harlan Boyles/Edward T. Alter Distinguished Service Award from NAST and the President’s Award from the National Association of State Auditors, Comptrollers and Treasurers (NASACT). Stenberg was elected Nebraska Treasurer in 2010 and re-elected in 2014. His term ends in January. He did not seek re-election because of term limits.